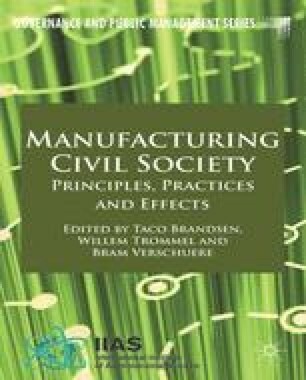 In the opening to this volume the editors pointed towards the increasing use of third sector organisations (TSOs) across Europe and elsewhere to deliver public or human services, as welfare states struggle to meet increasingly diverse and complex social needs (see also Pestoff & Brandsen, 2010). In this context, new forms of coordination to manage and organise these emerging relationships between states and TSOs have been required (Bode, 2006; Osborne, 2010). Though national nuances exist, recent evidence suggests there is growing convergence towards the use of (quasi) market systems to govern relationships between states and TSOs in public service delivery (Henriksen et al., 2012; Ascoli & Ranci, 2002).